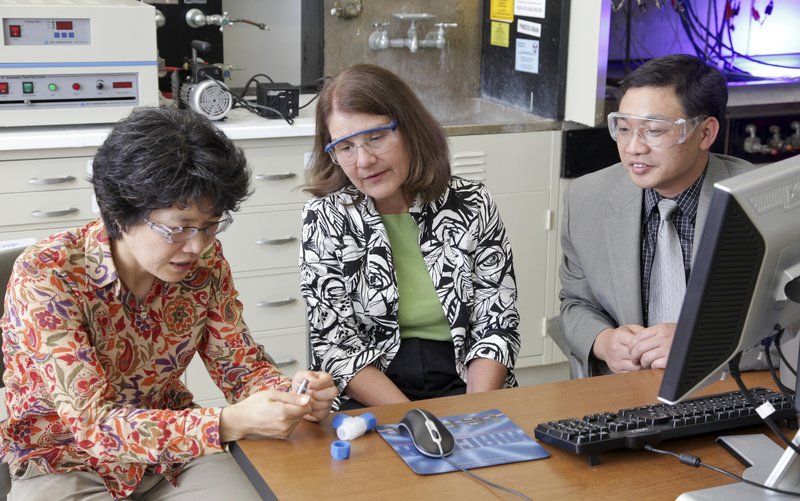 ORNL’s Nancy Dudney (center) and former lab researchers Jane Howe and Chengdu Liang were among the developers of lithium-sulfur materials that have been licensed to Solid Power for use in next-generation batteries. OAK RIDGE, Tenn., Nov. 20, 2015—The Department of Energy's Oak Ridge National Laboratory and Solid Power Inc. of Louisville, Colo., have signed an exclusive agreement licensing lithium-sulfur materials for next-generation batteries. The company licensed a portfolio of ORNL patents relating to lithium-sulfur compositions that will enable development of more energy-dense batteries. ORNL’s proof-of-concept battery research has demonstrated the technology’s potential to improve power, operating temperature, manufacturability and cost as well. The mission of Solid Power is to develop next-generation energy storage devices for the rechargeable battery market, which is dominated by lithium-ion technologies. The current annual rechargeable battery market is estimated at $12 billion and is anticipated to grow to $20 billion by 2020 to meet demands in consumer electronics, electric vehicles and military, aerospace and industrial applications. The ORNL technology will aid Solid Power in the development of solid-state rechargeable batteries that can provide two to three times the energy of conventional lithium ion technologies. Because all-solid batteries lack any volatile or flammable liquid components, they hold potential to save costs by eliminating many of the expensive safety features typically associated with lithium-ion systems. Solid Power plans to bring the technology to market using a simple battery cell architecture that leverages industry standard manufacturing processes. The company recently constructed a 700-square-foot dry room facility with roll-to-roll processing capabilities that will translate to production scale. This capacity will allow the first large-scale prototypes to begin production before year’s end and to continue in 2016. The technology was developed by a team of current and former ORNL researchers including Chengdu Liang, Nancy Dudney, Adam Rondinone, Jong Keum, Jane Howe, Wujun Fu, Ezhiylmurugan Rangasamy, Zhan Lin and Zengcai Liu. The license was negotiated by ORNL commercialization manager Eugene Cochran. ORNL research and development on the lithium-sulfur materials was supported by DOE’s Office of Science and the Vehicle Technologies Office in DOE’s Office of Energy Efficiency and Renewable Energy. Materials synthesis and characterization were conducted in part at ORNL’s Center for Nanophase Materials Sciences, a DOE Office of Science User Facility.